Tomorrow night over at The Mixoloseum chat room, the theme of the night is “Muddled” where each drink will require the muddling of some component. The theme is very apropos because I recently bought the best muddler I’ve ever used. Specifically, I’m talking about PUG! muddlers. I had read a few articles on these hand-made muddlers around the interwebs and they have had some great reviews. 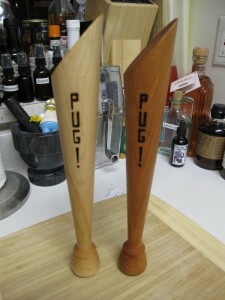 Where most bar equipment can readily be purchased on-line at any number of on-line retailers, PUG! muddlers are a little more difficult to come by. You see, there is no website to sell them. The maker, Chris Gallagher takes orders via email. It is actually a great way to talk to Chris and find out what types of wood he’s using at any given time, photos of various muddlers and the cost. PUG! is actually an acronym for “Pick Up Gallaghers!” and to be honest, I don’t think I’ll pick up another muddler again. These are that good. You can see from the photo above that the shape is pretty unique. The angled top really allows the palm of your hand to rest comfortably on the muddler. It also gives you more control and a more efficient use of force to muddle. In other words, it doesn’t take a lot of pressure to really do the job. The height of the muddler also allows you to really reach the bottom of your mixing glass or tin. These things are a beast! And can offer personal protection if an unruly customer comes calling! Almost as tall as a bottle of gin! When I emailed Chris, I asked for the cherry wood muddler. One thing I didn’t think about, and Chris was kind enough to point out before I made my purchase, was that different woods have different densities. These densities play a discernable role in the job at hand. A lighter wood will require slightly more force to muddle than a more dense wood. 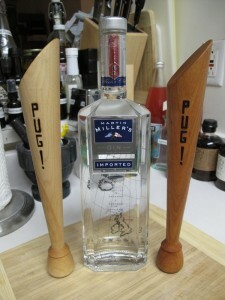 When Chris sent me the shipping confirmation, he dropped the bomb that he was also sending me the maple wood muddler! He asked me to put them both through their paces and let him know what I thought. Well, this past weekend at Sean’s housewarming party, Sean, Rick and I did just that. Both muddlers worked wonderful. The added bonus of the heavier maple was that it could be used to bash the living hell out of ice cubes for crushed ice and swizzles. We all know how Rick loves his swizzles . . .
I’ll be honest, these muddlers are not cheap. Depending on the wood they run $30-35 and the more exotic Mexican hardwoods run in the $60 range. Is this more than you are likely to pay for any other muddler? Most likely, yes. 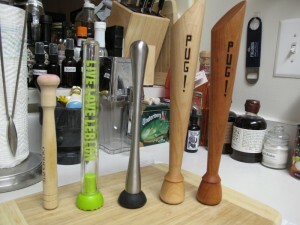 Is this one of the best bar implements I currently own? Yes. Will I recommend these whole heartedly? YES! If you are interested in purchasing a PUG! muddler, email Chris Gallagher at jcgallagher08@hotmail.com.